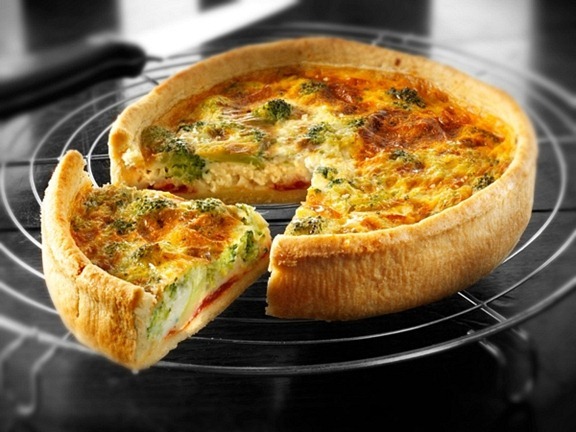 I haven’t made quiche in a while and I found a great recipe as I was looking for ideas and doing the menu last week. I made it yesterday and it’s the best I’ve quiche I’ve ever had, the gluten free crust was crispy and delicate, the filling just right. Cut butter into small slices. Chill until firm, about 30 minutes. Place rice flour and salt in a food processor with the S- blade. Add frozen butter and buzz, in bursts, until the dough balls up. Spread into a pie pan, or a spring form pan. I like my clay pie pans for these crusts. Line top of pie shell with buttered foil and fill with pie weights. If you don’t have pie weights, sit another pie shell on top and bake until pastry is set and edge is pale golden, 20 to 25 minutes. Carefully remove foil and weights, then bake shell until deep golden all over, 30 to 40 minutes more. While shell bakes, steam broccoli 4 minutes. Drain broccoli and rinse under cold water to stop cooking, then pat dry. Whisk together garlic paste, eggs, coconut cream, nutmeg, rice parmesan and 1/4 teaspoon salt in a large bowl until smooth. Pour filling into pie shell and add broccoli.